This A4-sized art book comes shielded in an outer vinyl cover, in a similar style to the one used on LEAF Illustrations Tatsuki Amaduyu Edition. There's a warning about the vinyl cover stuck onto the front too, but I can't read it. Hopefully it doesn't say something about not removing the cover! Either way, I was able to fit it back on easily enough after removing it. Blue Submarine No. 6 is the first series featured, as the book dives right into the section after a see-through tissue paper title page. This late 90's OVA series was visually ahead of its time, and had the designs to match. Oh, and in case you're hoping for Mutio sketches and illustrations, Mutio and the other "creatures" were designed by Takuhito Kusanagi so there aren't any in PRISMTONE. Well, there is one of Tetsu Hayami and Mutio at the beginning of the section. 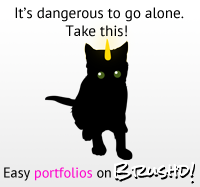 In this monochrome section and others, characters sketches are categorized, with characters clearly labeled on the tab-like design bordering the top of each page. There are two fold-out posters in the Blue Submarine No. 6 portion, with an illustration on each side. Without counting the posters, there are a total of 14-pages in color, with the rest being sketches in this 96-page section. 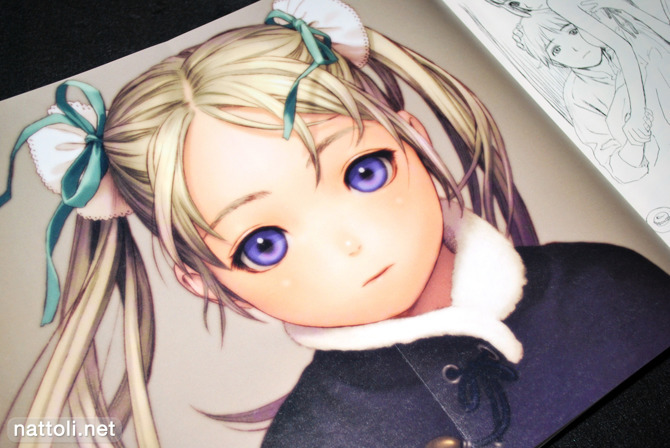 While Range Murata's sketch work is gorgeous in most cases, the ones for Blue Submarine No. 6 aren't as dynamic as the rest of the book, and serve as little more than character line arts for the most part. The posters through out the book aren't numbered or included with the actual page numbers, and out of these poster pages many have multiple illustrations on each panel of the fold-out. 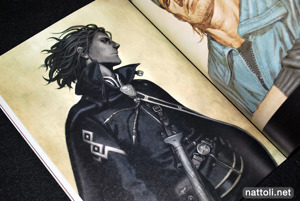 Multiple paper types are used through out the book as well, with color illustrations on smooth matte pages, and slightly rougher pages for the monochrome sketches. 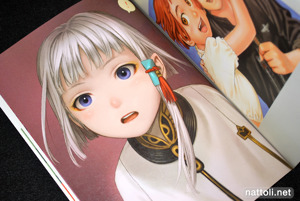 Last Exile is definitely the centerpiece of this art book, with more art work in terms of color works, posters, and sketches than the other series featured. 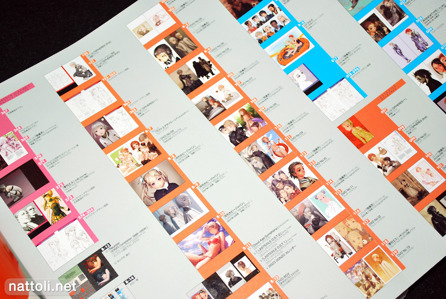 There are four fold-out posters in total, with one of the posters being a 4-panel long image, and the opposite side showcasing four separate illustrations. Though none of the images are new, many were initially featured in magazines and box sets and not as promotional works, so they haven't been seen much. The incorporation of the posters pages in really well done. In most art books, if there's a poster it's going to be at either the very front or very back of the book. Construction-wise, it makes it so the book won't warp or bend in the poster areas, because binding is different at the front of glue-bound books, usually attaching it to the inside edge of the front cover itself. But the posters in PRISMTONE are placed throughout the inside of the book, and I think that due to the overall weight, tightly packed pages and the way they're folded slightly away from the inside edge will help keep it flat even when shelved. Only time will tell though! 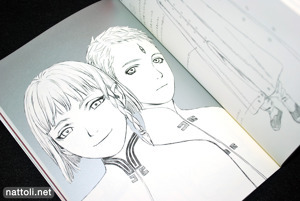 From a quick comparison, the entirety of the contents in the Last Exile sketch portion of PRISMTONE are from the SPHERES doujinshi series that Range Murata self-published years ago. So if you're one of the many (me included) people who bought those, you've seen it all. Mardock Scramble is the last anime series featured in the book, with a total of five color illustrations, which includes one panel of a poster page. Though there are 31-pages of monochrome illustrations, many look more finished than the usual sketches, with elaborate dress designs and clean shading. After being cancelled years ago as an OVA series, it would appear that Mardock Scramble is back in the works as a movie, though the characters are no longer designed by Range Murata. The index at the end of the book is on the inside of a poster sheet, and it's only useful for the color illustrations; the monochrome sketch works are lumped together under "Character Design Works" because that's where they were from before they were doujinshi ^^; However, the monochrome sketches are really well commented, with additional insights into the drawings all from Range Murata. 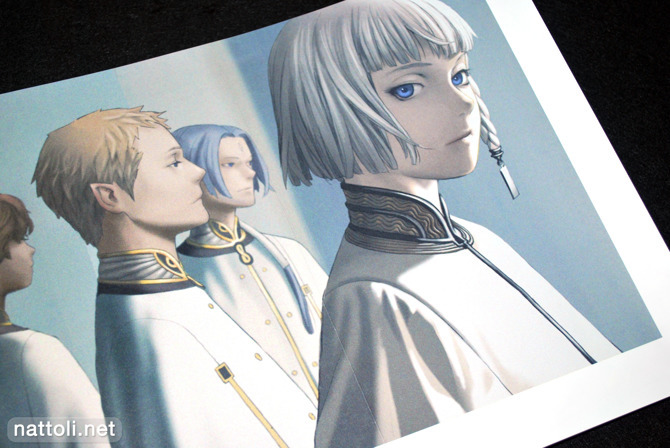 At the very end is a half-sized magazine style display titled "Memorial Products Showcase" showing the merchandise and goods available from Last Exile and Blue Submarine No. 6 in an artistic way. I think ultimately that inspite of the heavy amount of sketch work and repetition from other doujinshi I've purchased in the past, I really like PRISMTONE Range Murata Anime Works 1998-2006. It's really creatively made and surprisingly there were works in there that I hadn't seen before. There's probably some bias to account for as Range Murata is one of my favorite artists, but having known ahead of time the ratio of sketch work to finished color illustrations made it easier to accept and appreciate it for what it was; a really comprehensive character illustration collection. It took so long I was expecting perfection, still it's pretty good. Is Toranoana/Melonbooks/Sofmap, likely to be carrying this? Or should I just go ahead and pull it off amazon? All of those places should have it unless they sold out. Sofmap has a comparatively small selection of art books, so I'd go for Melon or Toranoana if you're trying to group stuff. If you're buying online, you just have to look under their commercial art books section; Toranoana and Melonbooks. Thanks for the review. You convinced me to buy it ^^. Can't wait to receive it now. Kinda miffed it does have all of Spheres, but eh, will get anyway, if only for a "one package to enjoy them all" aspect. 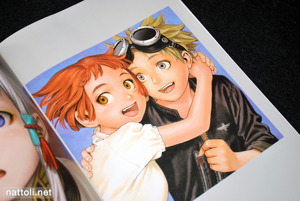 I absolutely love Range Murata, so I bought this during Akadot's 30% off sale. I was influenced by your review, so thank you :) I think it went out of stock, so I have my fingers crossed that I actually recieve it, haha. Wow! 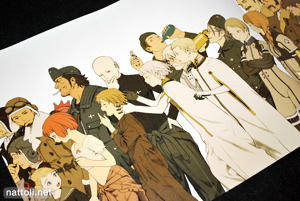 If it weren't for this blog, I would've missed this artbook. When I saw that it was out of stock on Amazon JP, I almost cried. >_<" But I managed to find it elsewhere that has it in stock. 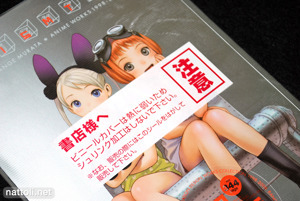 A tad expensive but hey, can't say no to 300+ pages of Range Murata goodness. Jumping again in with some good news that the book got already a reprint for those that were to late with buying it before!